The Green Valve is a fluid flow control valve that permits the recovery of some energy of the fluid flowing within the valve itself as well as accurate regulation of pressure and flow rate of the fluid. 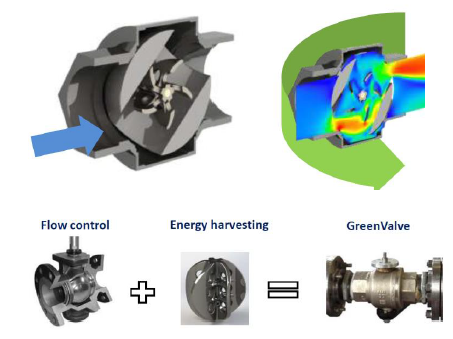 The simple idea behind this innovation is to recover part of the energy dissipated during the control-flow process thanks to the inclusion of a turbine inside the valve itself. The valve comprises a valve body, a flow deflector, a shutter, a rotor of a turbine and a transmission shaft, supported by bearings, which allow to transfer energy outside of the valve body. The rotor, consisting of a set of blades, is connected to the transmission shaft and is designed to rotate in a continuous manner under the action of the fluid. The drive shaft can be connected to an electric generator to provide electrical energy. 1. Simple construction and compact in size. 2. Able to recover part of the energy dissipated during the process of adjustment of flows and to achieve an accurate and effective regulation of the flow. 3. Green Valve can substitute existing control valve without the necessity to install further components on the pipeline or changing the operating conditions of the systems. 1. Industrial plants and distribution networks in different fields (electricity production, water, oil & gas, etc.). 2. Existing or new installations in which there is the possibility to recover energy. 3. It is also possible to build stand-alone valve for off-grid applications, where the actuator that moves the valves is not directly connected to the grid, but it is powered by the energy recovered from the control process itself.